Apart from the five official screenshots released by Rockstar Games, and those captured from the first official trailer, so far we've only come to see screenshots printed in magazine publications, which of course were graciously ported over to the web by way of a revolutionary digital invention, the almighty scanner. In order for us not to breach the copyright law, in which we no doubt would've gotten cease and desist letters if we had done so, we did not publish scans/screenshots from these publications. Today, however, we can put up a new screenshot. 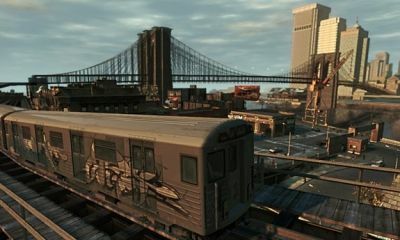 An article on the New York Times website, and probably published in print, in which the writer consulted Rockstar Games for comment, a digital screenshot, albeit small in size, showed up. No doubt is this from Rockstar Games themselves, and so we've decided to publish for all of those to enjoy. 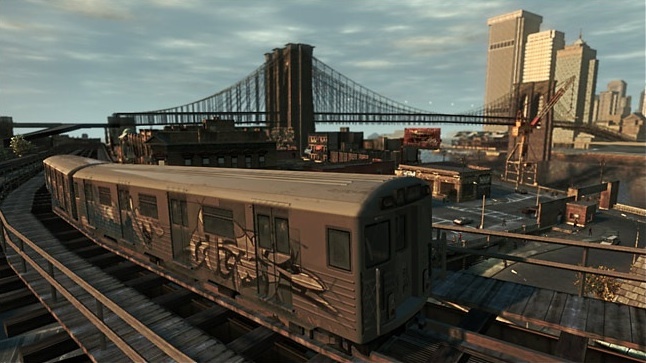 Well, here's the screenshot, showing a train on the elevated tracks passing over Broker. Click on the image below to see it in its full-size.